The other day, I was grumbling about making dinner, and my daughter said,"Is there any dinner you actually like making?" Well, that brought me up short. First of all, I didn't realize that I probably complain, out loud, about making dinner every single day. Which is silly. I make dinner every day! It should be like brushing my teeth or feeding the cats. I'm past my 10,000 hours of practice on this one. I've mastered it, so what's the downer part? I actually don't mind cooking. I can't think of something that I actually like the process of making, though. Maybe crepe suzette? Or some kind of baking technique that's a little artistic and also involves a dough I can sneak a spoonful of? But, cooking dinner is about so much more than actually cooking dinner. To get daily dinners on the table, one has to think of what to make, buy the ingredients, get them home and put away, prep them and cook them After all that what's the reward? A sink full of dishes. Does this begin to explain why I'm maybe not so receptive to even the gentlest of suggestions about what not to make again or to cook with less charring? Alas, I am responsible for getting dinner on the table every night and there's no way out of it. The people I feed have their own responsibilities, and this is just one of mine. I never even think about physics homework or power washing the patio. So I've picked the one thing I hate the most about making dinner and made it easier on myself: dirty dishes. I'm not going to suggest that you order takeout or use disposable plates, though those work too. These are things you can do any night of the week that won't hurt the environment or you pocketbook too much. Here are my tips to reduce the dishes that need to be washed after dinner. 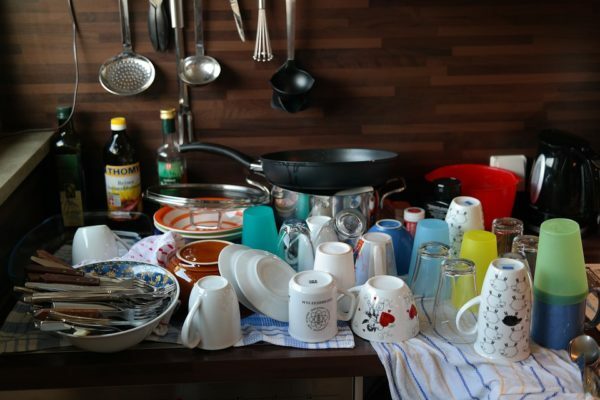 Do the dishes as you go: Go ahead, roll your eyes, (I'm a mom, I'm used to it) but if you wash and put away (or start the dishwasher load) as you go, there's less of a mess at the end. Clean while baking: I get a glazed look from my family members when I brag about this technique, because they're like "Whatever, cleaning nerd." Right up until I tell them I'm withholding the wifi access until the kitchen is clean. You can save yourself a whole lot of scrubbing if you deglaze a pan that has food stuck on it. It's a technique we all know for creating a sauce or gravy for your meal. Lets say you don't want a sauce. Let's just imagine that the bits of food are so burned that they would make an inedible sauce that would ruin dinner if you just poured it over the food anyway. Its fine! You can still get the pan almost clean when you add a liquid and use a wooden spatula to remove the bits. Instead of the hot and cold wet soapy mess of the sink, you're at the well lit stovetop where the dish is conveniently not just out of arms length at the bottom of the sink! You are not bent over with a brillo pad questioning your very worth! Sheet pan meals: These are meals that cook on one or two sheet pans or cookie sheets. This works really well with bone in chicken pieces and veggies and fish baked with seasonings and sides in parchment. Speaking of parchment, it will be your savior here. Line your sheet pan with parchment first and your pan will be clean at the end. 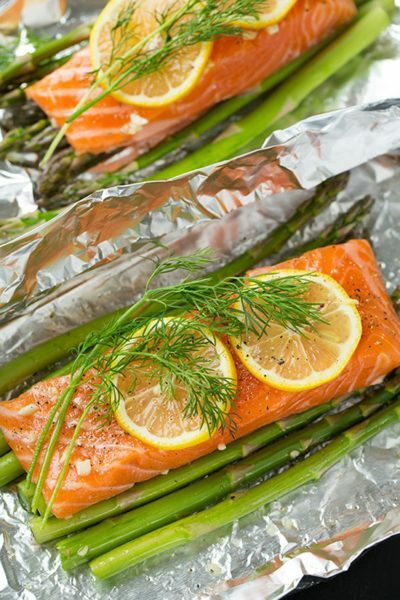 Many of these dishes exude liquid or call for a good amount of oil, so to be sure, you can put down a layer of aluminum foil below the parchment. I find that food can stick to aluminum foil, and I'm also always hearing that there are possible health risks involved with cooking food directly on aluminum. Also, you might be able to skip the pan altogether! Slow cooker meals: Another one dish winner! True, slow cooker meals do mean you'll have to think about dinner before lunch, but results are worth the advance preparation. You may have an instant pot, which can do similar work in much less time. And I hear they are pretty easy to clean. The modern casserole: Baked dishes, like lasagne or chicken cacciatore, go in one baking dish. Yes, you'll probably have to sauté some elements (but maybe not) in another pan. For the baking, you can use the parchment paper trick here too, but glass pyrex dishes are actually dishwasher safe!I made a family favorite last night and the pyrex went right into the dishwasher. Dishwasher safe, please: If you have to wash the dishes, at least let the dishwasher help! We have these plastic glasses that are the bane of my existence. I almost knocked my daughter over with a big hug when she brought only glass (dishwasher safe) glasses to the table and announced she would make sure we always used them to help the environment. Think about edible dishes. Wait, that can't be the best name. I'll think about it. But what I mean is if you cook your meal in another kind of food, then the pot/pan is actually in your stomach at the end of the meal. It works with these adorable shepherd's pie potatoes and these baked tomatoes. I saved the best for last. Don't do the dishes! Let someone else do it. Spouses, kids, visiting in-laws. They'll all do it with varying levels of incentive (I sometimes feel like I have to have a plan to prevent my mom from doing my dishes when she visits!). After all, you're going to have to do it all again tomorrow!